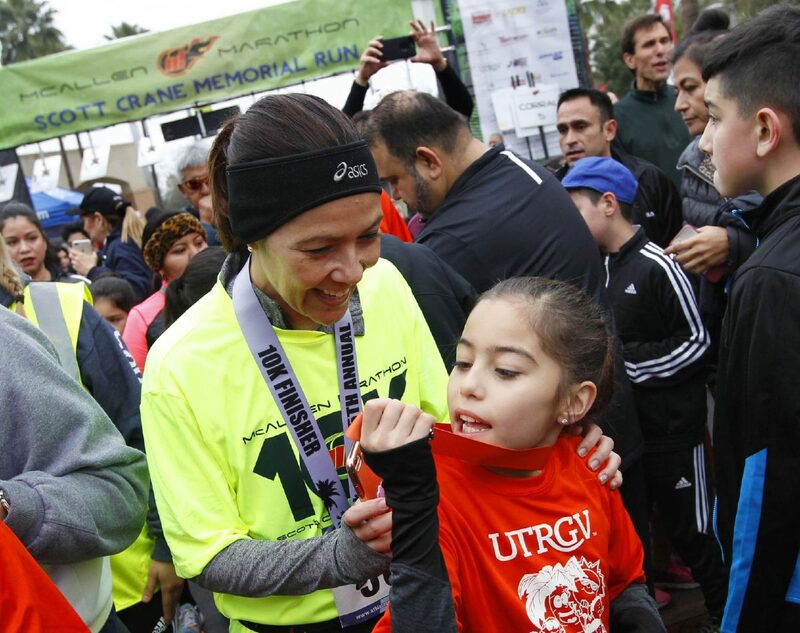 McALLEN — On the east side of the convention center, thousands of youth were seen jogging in place and stretching their limbs Saturday morning in preparation of the final mile of the 4th annual McAllen Kids Marathon. This concluding mile, which was run around the grounds of the convention center, ended on the same note in which the race began — as a community. Over 3,500 individuals reunited for the event. Last year, on Sept. 9, runners first gathered to commence the marathon at the Veterans Memorial Stadium track. The all-inclusive event aimed to encourage physical activity and to promote a healthy lifestyle by inviting the McAllen school district to get involved. Throughout the course of four months, participants made the dedication to pace themselves to complete the same number of miles as run in the Scott Crane marathon, from which the event spawned. The activity was logged based on an honor system that held the individuals accountable. Runners made it out by 8 a.m. to complete registration and line up with their groups. To control traffic and pacing, groups were divvied in different age groups (participants from the McAllen districts ranged from kindergarteners to eighth-graders) and released in a sequence. For many, this was the first marathon ever completed. Best friends Brenda Sandoval and Maria Hannon, both 13, from Michael. E. Fossum Middle School, were eager to complete their last mile. According to the twosome, who matched in track pants and the bright orange UTRGV sponsored T-shirts, their entire school has been involved in the initiative by logging steps during the physical education period. Following the performance of the National Anthem held on the stage in which Mayor Jim Darling and other city representatives gave speeches, Capable Kids commenced the race at 9 a.m.
Viva Selene Lopez, 22, jetted off with great enthusiasm, leaving her mother, Mary Jane Lopez, and others in her trail. Viva represented her autism by wearing a tutu made of different colored tulle that represents the condition. According to her mother, it was given to Viva as a gift straight off the body of a runner from the Autism 5k Run and Fun Walk in which Viva participated in last year. Capable Kids worked with the city to tailor a route that best ensured the safety of the special education community. Many of the runners from the organization also kept a log of their miles.